WILMINGTON, N.C. – Highlighted by matches against NCAA tournament participants FIU and South Carolina, UNCW Head Coach Amy Bambenek has announced the schedule for the upcoming season. "Overall, this schedule gives our team the opportunity to learn and grow while competing against newly established programs and some nationally-ranked and veteran programs," said Bambenek. "Our team has a strong mix of talented players who are now in their fourth season with the program, as well as a core group of talented newcomers that improve daily." The Seahawks open their fourth season as a varsity program at the UNF Invitational (Mar. 1-2) against St. Petersburg Junior College and FIU, which earned a NCAA tournament bid after losing in the Coastal Collegiate Sports Association finals to Florida State. UNCW will play rival College of Charleston and host North Florida the following day. UNCW will host the fourth annual Dig & Dive Beach Classic on Mar. 23-24. Joining the Seahawks that weekend are Morehead State, Florida Golf Coast, Tusculum, Carson-Newman and Coastal Carolina. "Our tournament at Dig & Dive will be our largest home event we have hosted with seven teams." The Seahawks will play South Carolina twice, first at the Coastal Carolina Duals on Mar. 9 and then again in the season finale on Apr. 13, in Columbia, S.C.
UNCW will also compete in the Texas A&M Corpus Christi tournament (Mar. 15-16), the Georgia State Diggin' Duals (Mar. 29-30) and the Palmetto Invitational (Apr. 12-13) hosted by South Carolina. Three programs appear on the UNCW schedule for the first time including Tampa (Mar. 29), Arizona State (Mar. 29) and Missouri State (Apr. 13). The CCSA Championship tournament is on Apr. 19-21 in Emerson, Ga., and the NCAA Championships will be played in Golf Shores, Ala., on May 3-5. The CCSA grows to 12 members for 2019 with Southern Miss and TCU joining the mix. "The sport of beach volleyball is continuing to grow so I'm excited to face some teams we have yet to play in our three year history. Our fellow CCSA opponents will no doubt be our toughest contenders with seven programs finishing in the top 20 last season." 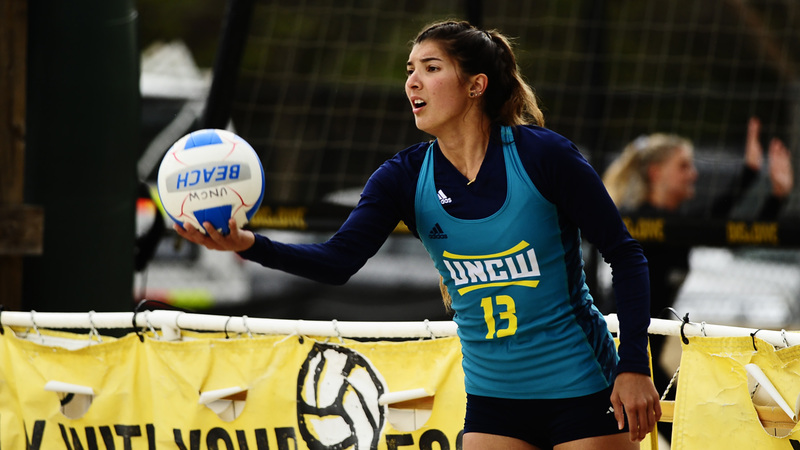 WILMINGTON, N.C. – UNCW's popular beach volleyball program is in full swing and the Seahawk Digital Network takes a look at the program and its rapid growth in this special feature. Seniors Maddy Kline, Anna Grauel, Halle Hunt and Katie McCullough have been pioneers for the program since its origination four years ago.